For some reason the client ID and trial week “for office use only” is not showing up on the summary page and export for a number of our questionnaires. When you click into the questionnaire it shows the ID and trial week but this is a problem as when we export the data it isn’t showing up. We haven’t done anything differently so not sure why this is happening? I have attached a copy of a screen shot for your reference. Hi Kathryn, thanks for posting to Community! I think I may have an idea of what’s happened here. Not long ago, a correction was made to our “Admin only” question feature to prevent them from being included in the normal flow of a survey (and possibly accidentally shown to a respondent). An unintended side-effect of this change was that if you have a merge code as the default answer for an “Admin only” question, it will not be processed as the survey is being taken. The field will instead remain blank. I’m very sorry if this is indeed what has affected you! 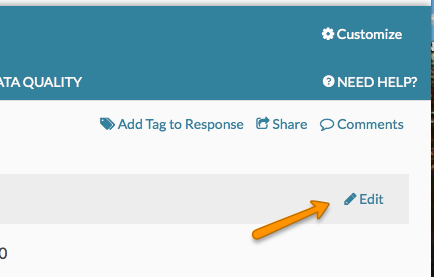 To fix any responses that were recorded while your survey was in this state, you may go to the Results tab and to the Individual Responses section, and click on an affected response. On the page containing your admin-only question(s), click the Edit link in the upper right-hand corner, and then simply click save on the edit panel that opens. This would need to be done for each affected response. I apologize again profusely for any inconvenience this change may have caused, and I hope you find this information helpful!